Nov 20 2018 - Fixed Windows 10 and Windows Server 2019 version 1809 has now been re-released, details at Microsoft Windows 10 and Windows Server 2019 download links for re-released version 1809 October 2018 Update. 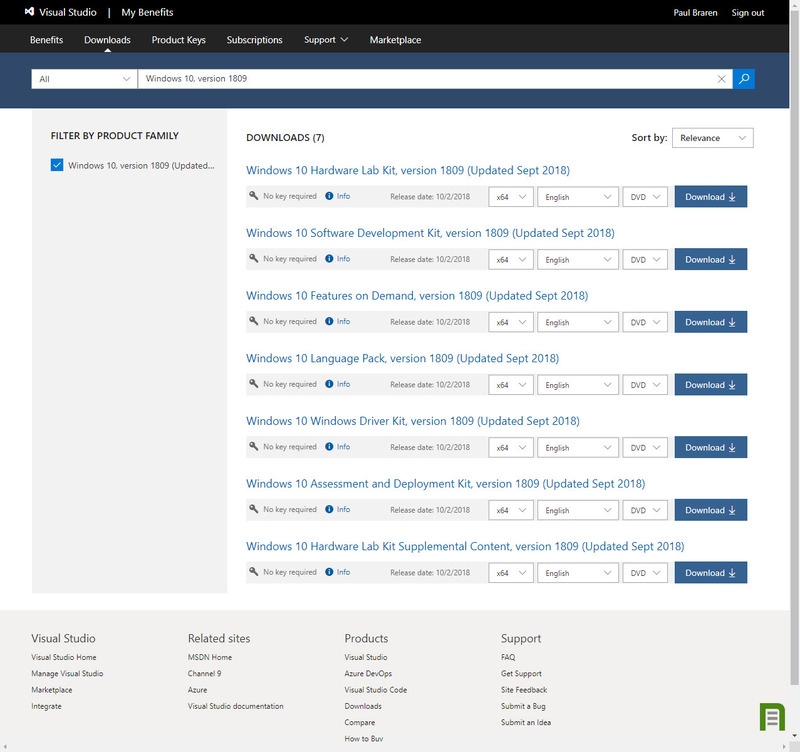 Fall 2018 is quite the season with Microsoft Windows Server 2019, Windows 10 October 2018 Update, and VMware vSphere 6.7 Update 1 releases! Turns out it was not just the license key missing, it's was the code too, ISOs, VHDs, everything, as pictured below. 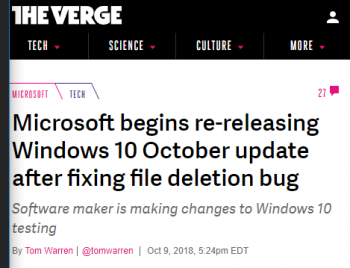 I tweeted about this at 9:58 PM - 5 Oct 2018, and when I noticed the code still missing this morning, I checked around to find a few new "Windows 10 pulled" articles had just popped up overnight. I also then recalled one of my sons had issues with trying to get his Microsoft Surface to update its Windows 10. I notified Brad Sams, hoping to get some sort of official confirmation from Microsoft. He quickly created his own post that kindly references a later spot in my same twitter thread. Special thanks to Doug Arcidino @doug_arcidino, for confirming my inability to download wasn't just me, quickly. Once the new bits are available as ISOs, I'll have to revisit my article too, but that's ok, just trying to help folks find definitive info while we await further details and recommendations from Microsoft. 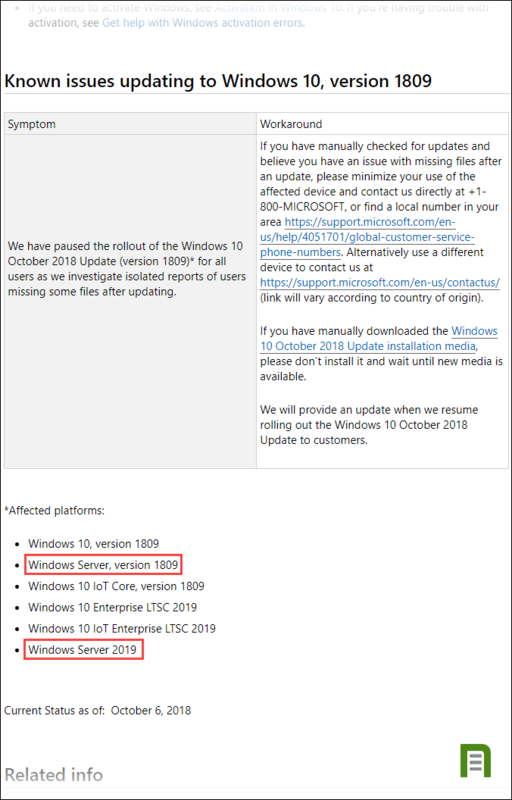 It seems that some time last night, Microsoft pulled not just Windows 10 October 2018 Update, but also pulled Microsoft Windows Server 2019. My tweet last night appears to be the first report of this, with Google searches still coming up with nothing definitive. A bump in the road, likely to be resolved in just a few days, we'll see. I was just trying to squeeze in some more tire-kicking before a bunch of travel. I do have one Windows 10 October 2018 Update system I do use that I now need to consider rolling back from, using a bare metal restore from my full Veeam Agent for Microsoft Windows 2.2 backup, or just a file level restore of My Documents to see if any files went missing. This could be a situation where Microsoft's built-in Recovery options in Windows 10 might not help, way too early to know. Other than the sysadmin burden, this hiccup in code roll-out isn't a big deal for me personally, but I suspect there's a lot of folks in Redmond who are not getting time off this weekend. See also Microsoft Pulls Windows 10 October 2018 Update and The Morning After: Windows 10's October update problem. 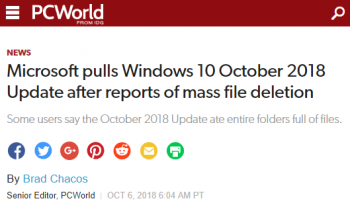 Some users say the October 2018 Update ate entire folders full of files. Fortunately, the issue was caught before mass rollout. 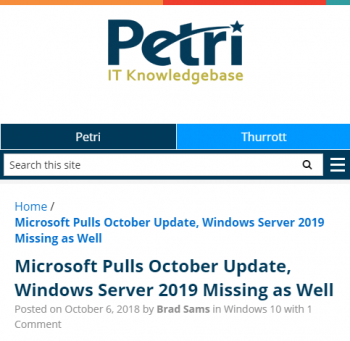 While enthusiasts could manually install the October 2018 Update since October 2, it was scheduled to be pushed out to the masses via Windows Update on October 9 as part of Patch Tuesday. “If you have manually downloaded the Windows 10 October 2018 Update installation media, please don’t install it and wait until new media is available,” the support site suggests. 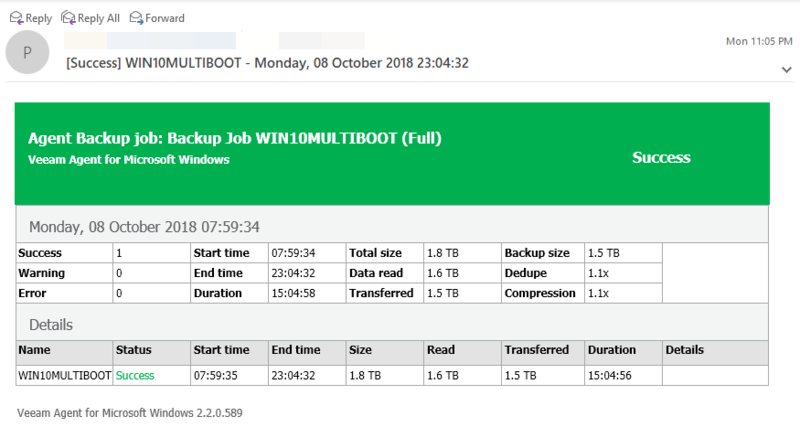 Given this information, it seems likely I'll need to roll my system back by restoring my Oct 03 2018 02:15am Veeam backup of 2TB of data, my last full backup before the Oct 04 01:53 am date/time-stamp on my upgraded system's C:/Windows.old directory. I suppose I'm glad I can get this done on the weekend. 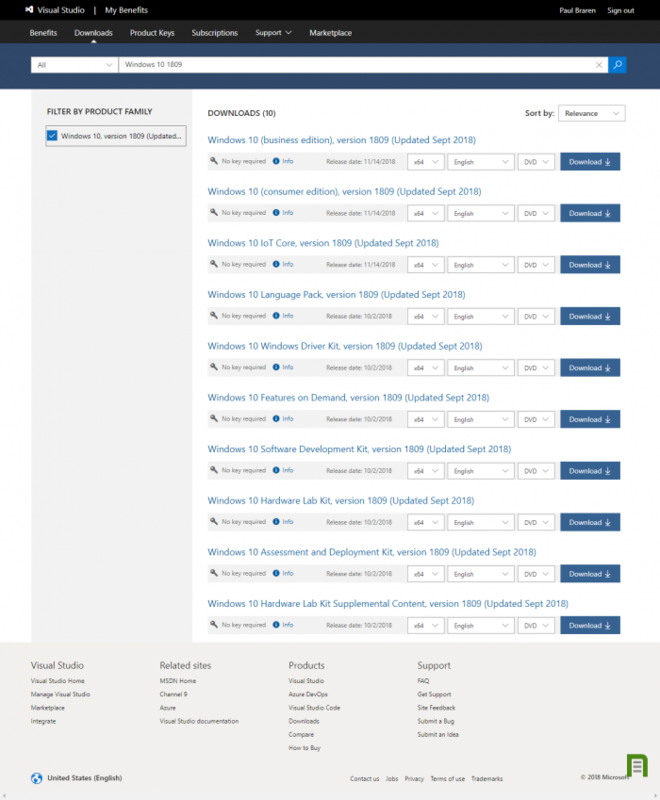 October 2018 is quite the month for lab testing Microsoft Windows Server 2019, Windows 10 October 2018 Update, and VMware vSphere 6.7 Update 1! Given folks weren't checking the Press Release source of the Nov 2nd date, the release excerpt itself has also been added to the article above. Click to view the latest version of the entire Microsoft article. After resetting my Veeam database and doing a completely new full backup, I was able to verify everything was working fine. Then I deleted my Windows 10 1809 VM. So my full backup of my restored VM is now done, and this minor set-back is entirely behind me now. Everything is working great, just as it was last Wednesday, and my confidence in my ability to recover from nearly anything is now strengthened greatly. Veeam Agent first new backup completed. This turned out to just be some leftover files, not the ISOs for the OSs. 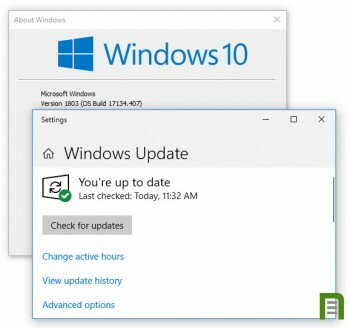 Microsoft is re-releasing its Windows 10 October 2018 Update today, following the company pulling it offline due to data deletion issues over the weekend. The software giant says there were only a few reports of data loss, at a rate of one one-hundredth of one percent. Microsoft is now re-releasing the Windows 10 October 2018 Update to Windows Insiders, before rolling it out more broadly to consumers. 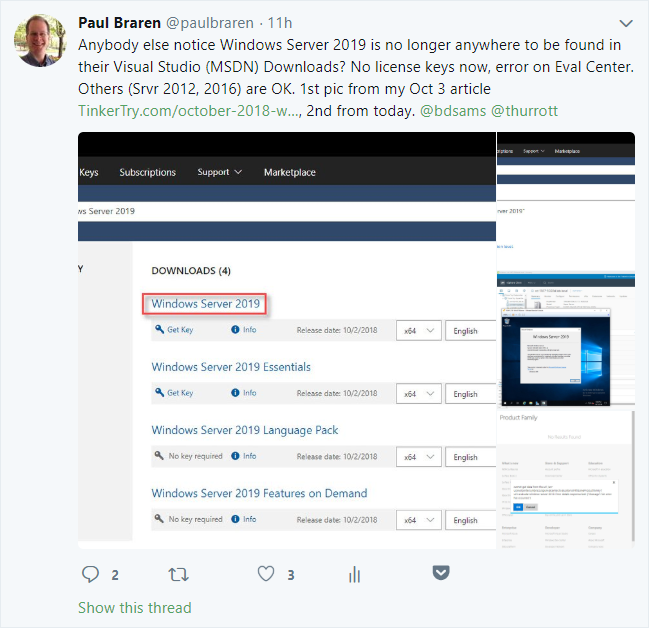 I'm here at Veeam Vanguard Summit in Prague this week, and have found that Windows Server 2019 is still not available on Visual Studio/MSDN. 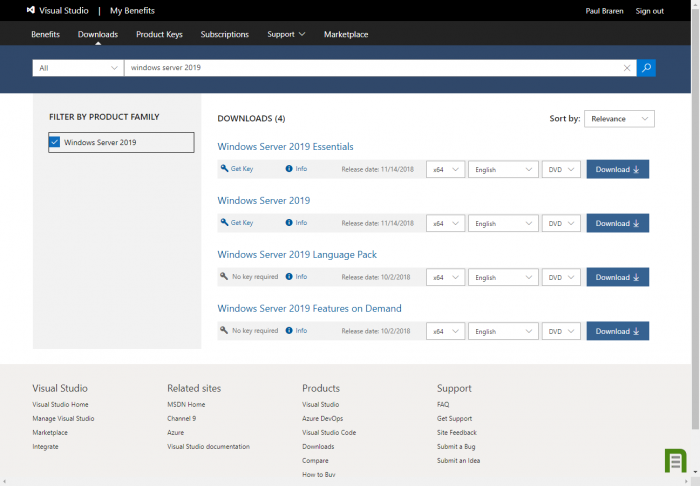 When is support for the upcoming Windows Server 2019 coming? Also, is there any update on Server Core support? While initial tests indicate that basic functionality of the current agent version is compatible with Server 2019, I recommend to wait until we ship the official support with next major version. This will give us the chance to complete the full regression testing on GA code, and ensure all agent functionality is working with Server 2019 as expected. 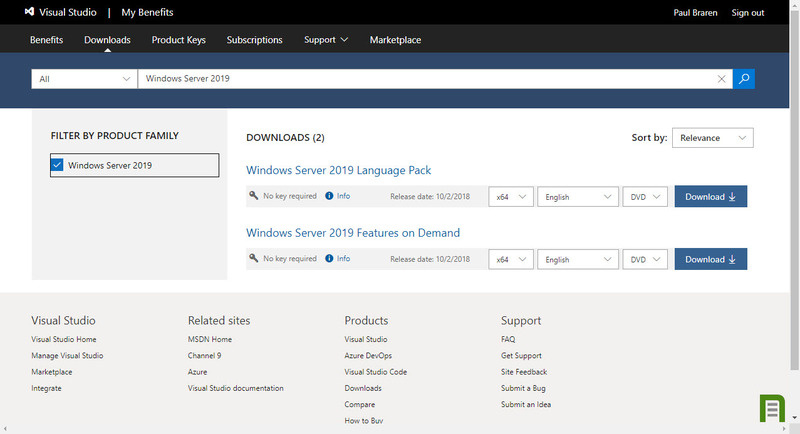 I checked Visual Studio/MSDN again today, still no Windows Server 2019 available for download. We have temporarily removed all media for Windows Server 2019 and Windows Server, version 1809. We have also paused the rollout of the latest feature update to Windows 10 inclusive of versions 1809, as we are investigating isolated reports of users missing some files after updating. If you have already downloaded media, please don’t install it and wait until more information is available to proceed. We apologize for any inconvenience this may have caused. We will provide an update when refreshed media is available. For reference, we also have a support article with additional information. 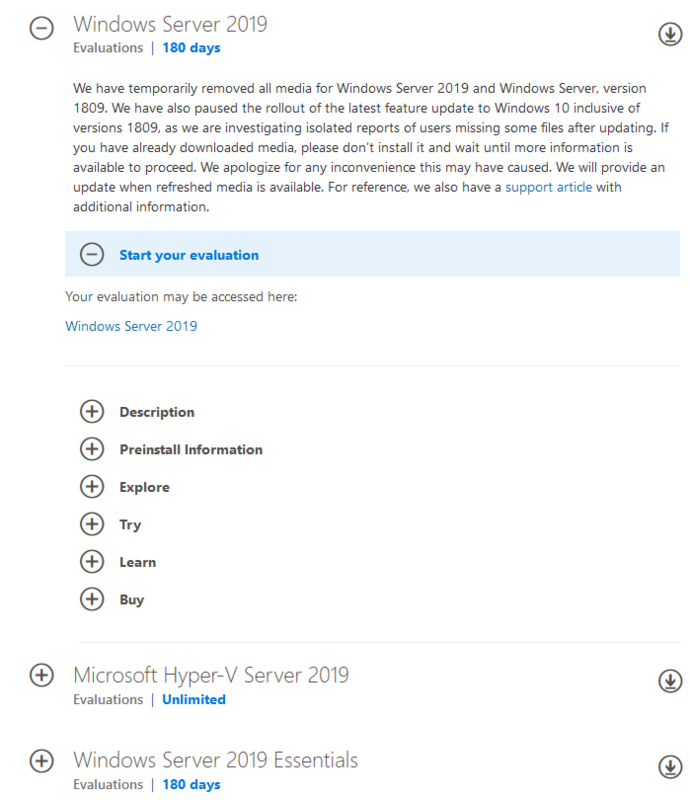 We are currently working on making the Windows Server 2019 evaluation media available. For more information, please check the Windows Server blog. I suppose it's time to learn more about servicing stack update (SSU), but let's be glad for the transparency. This Windows 10 Professional system is a VM running under VMware ESXi 6.7U1, and as of Nov 19 2019, version 1809 isn't offered through this easy update mechanism yet. I tried on other physical systems as well, same result, no update. My own home lab systems don't offer me the update with the usual Windows Update / "Check for updates" button, with folks exhibiting such seeking sometimes called seekers. Windows 10 itself is still missing from on Visual Studio Downloads. That didn't happen. It's now Nov 19, and Windows 10 1809 just isn't there on Visual Studio Downloads yet, seen by clicking on this screenshot I just created. 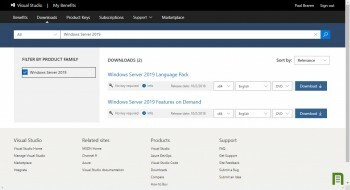 Windows Server 2019 itself is still missing from Visual Studio Downloads. 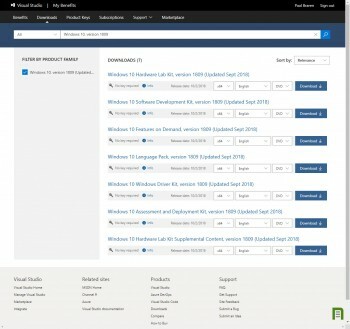 How about Windows Server 2019 version 1809 available yet on Visual Studio? Nope, it's still MIA too. There is no further evidence of data loss. 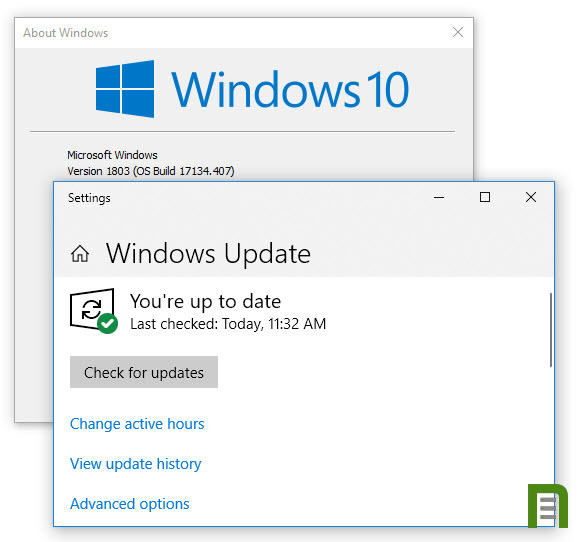 Based on this data, today we are beginning the re-release of Windows Server 2019, Windows Server, version 1809, and the related versions of Windows 10. It's amateur hour in Redmond. during the latest Windows Weekly (MP3): 595: The Power of the Gong Compels You. I've queued the audio and video versions to the beginning of the relevant discussion right at the start of this episode. So far, it's not looking too likely that IT Professionals hoping to get their home labs geared up with the latest code bits will have much to thank Microsoft for this (Thanksgiving) week, at least not so far. That said, waiting a little longer sure beats the prospect of losing files, no matter how low the odds. After full system backups are completed, I personally would much rather invest significant time doing lab updates and golden master VM templates based on known-good builds of Windows 10 and Windows Server 2019. Hopefully Microsoft's Visual Studio has both of these new release ISOs available well before late December/Christmas/New Years, when a lot of IT Professionals also try to take some time off from busy day jobs. Yes, some of us are crazy enough to spend some of that time in our test labs, getting a thrill from life at the bleeding edge. It's how we learn, by seeing what breaks, then sharing what we learned to help others, and to (hopefully) help vendors smooth out the wrinkles in their future releases. Thank you Microsoft, and Happy Thanksgiving! Pulling down both ISOs at once, I was able to get around 200Mbps average download speeds from my Cox Communications Gigablast ~900Mbps internet connection, taking only about 7 minutes to pull down 9.4GB data. Nice! Looks like EdgeCast Networks is the CDN serving up those Visual Studio bits to me here in 06109 in Connecticut today. Above, you'll see my Resource Manager screenshot showing the server IP, details how over here. I added additional files/descriptors to the ISO file download list above, confirmed that filenames stayed the same. I noticed that there is still no Windows Server 2019 available on the Microsoft Evaluation Center. 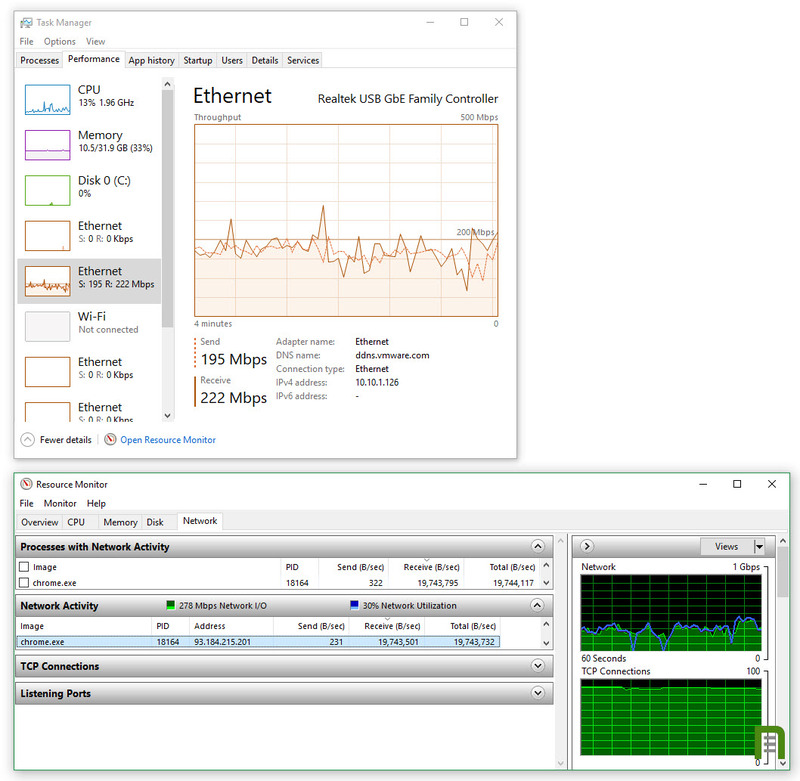 From Visual Studio Downloads, I tried downloading 4 different 4.7GB ISOs at once today, top speeds seem to be limited to around 180Mbps from the same EdgeCast Networks CDN IP address of 93.184.215.201 that I was automatically using yesterday. VMware vSphere 6.7 featuring vSAN 6.7 announced!